WizKids previews what may not be the most impressive piece from the set, but another fun one all the same, Cosmo. 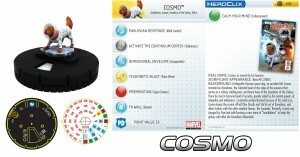 For today’s Marvel HeroClix: Galactic Guardians preview we are presentink to you Mother Russia’s inadvertent addition to the Guardians of the Galaxy. Please to be welcomink the space dog known as Cosmo!